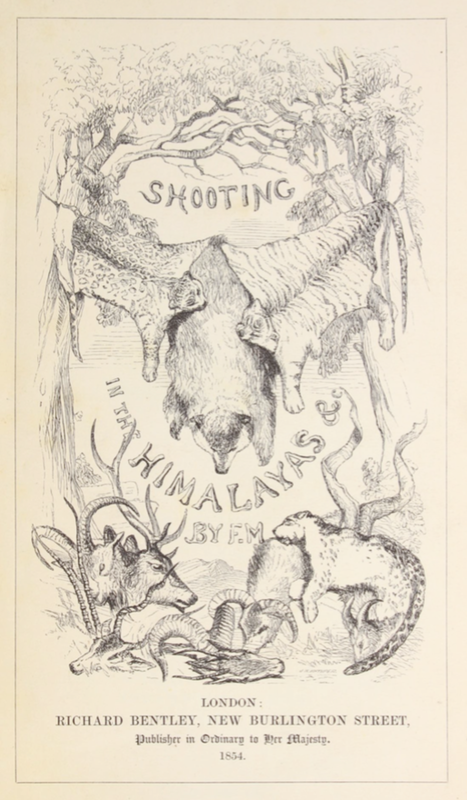 Shooting in the Himalayas is a sporting journal written by Colonel Fred Markham during his six-year stay in the Himalayas and its surroundings as commander of the 32nd regiment that embarked for India in the early summer of 1846 in connection with the campaign on the Sutlej. During his duty in India, Markham takes several leaves of absence for periods of six months in order to hunt different types of animals in the Himalayas. This is a journal of a sportsman’s life in the Himalayas with lengthy accounts of the wildlife in India and Tibet from a British hunter’s perspective. Throughout his travels in the Himalayas Markham gives extensive descriptions of animals such as the tahir, deer, musk-deer (a sketch of which can be seen on p. 101), leopard, gooral, pheasant, snow-bear, burrell (the famous wild sheep of the Himalayas; a sketch of a burrell’s head can be seen on p.71), gerow (a sketch of which can be seen on p. 40), otters, snow pheasants, black partridge, quail, the hungul (a twelve-horned animal, with six points on each horn), the markhoor (a species of wild goat), the ibex and the Ovis Ammon (a mountain sheep; a sketch of an Ovis Ammon skull can be seen on p. 338). The animals and the wildlife are meticulously described as well as ways to hunt them. There are sketched illustrations of animals, people and nature throughout the book. 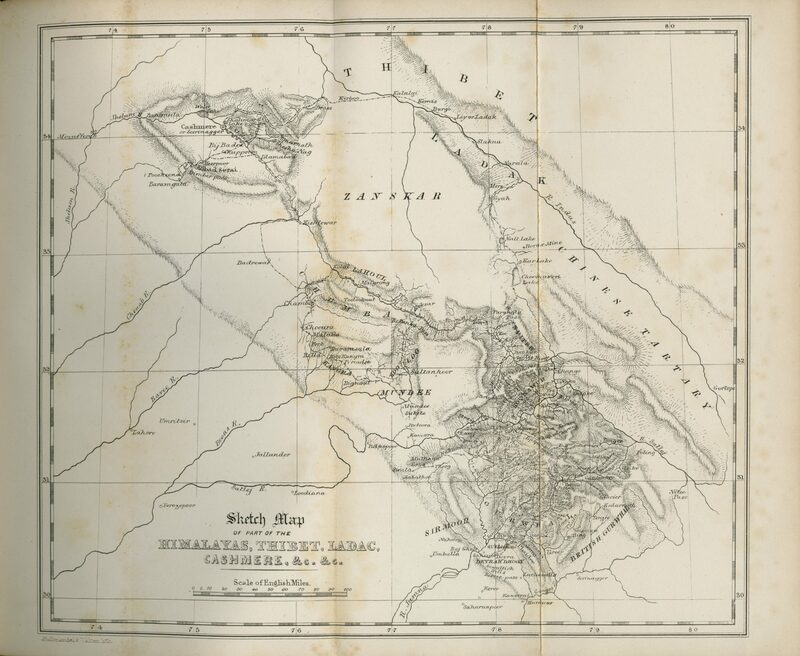 A map titled “Sketch Map of part of the Himalayas, Thibet, Ladac, Cashmere, etc” is available on pp. 2-3. In the spring of 1947 (chapter 1) Markham and his regiment travel from Chinsurah, a town twenty-six miles from Calcutta towards Meerut with 700 bullock hackeries and 2000 followers. In Meerut, as the hot season is upon them and drilling is made impossible, they are left with nothing to do. For Markham this is an opportunity to take a leave of absence for six months in order to go to the Himalayas for hunting with a group of sportsmen on horseback, together with carriers, and elephants. They are first driven 60 miles to Deobun from where they continue on to Deyrah Dhoon and then to Jogee-Wallah. The author gives a small account of the Sewalick Hills, which divide the valley of the Dhoon from the plains of India. They camp at places such as Khanserai-chokee and Hurdwar, where a great fair is going on. Later they return to Deyrah Dhoon. In chapter 2 (pp. 14-40) the hunters walk seven miles uphill to Landour and then to Phaidee and Bala. Markham describes the scenery as beautiful with the hills covered with oak and rhododendron. At each stop the author gives descriptions of the surrounding nature and the types of animals they hunt at each place. In chapter 3 (pp. 41-71) the group ascends Bengallee Hill where they see traces of bear. They then continue to Jalah and Gangoutrie. They cross a 40 feet long (12m) and 200 feet (61m) high bridge called Biram-ghattee over the Ganges river which is destroyed every year by an avalanche of snow and on which the Rajah and the Teree spend 14 rupees annually for its restoration. In chapter 4 (pp. 72-101) the journey continues to Simla and on the road to Barrahaat the group runs into a large party of “flat-faced” Tartars who are crossing the mountains with sheep and donkeys carrying salt and corn. An interesting observation that the author makes about these Tartars is that: “They were not much dirtier than our Puharrie coolies, and appeared frank and open in manner.” (p. 75). The group continues to Jumna where they kill otters. Afterwards they walk uphill to see the Rameserai Valley from the top, described as “one of the tracts fixed upon for the trial of the tea cultivation. The gardens are thriving admirably.” Uphill they spot snow pheasants for the first time. In chapter 5 (pp. 102-119) the hunters have returned to Meerut were they stay during the cold season. In February the regiment marches to Umballah through Delhi, after having been stationed in Meerut for a year. Here Markham describes the Puharrie coolies who carry their tents and things for them in kind words. He says that they are strong, civil and honest and that they like Europeans (a sketch of two Puharrie coolies can be seen on p. 119). Having arrived at Ferozepore, despite the unbearable summer heat, the troops are ordered to gather and execute the siege of Mooltan and the battle of Goojerat. In chapter 6 (pp. 120-147) we learn about the victory of the Goojerat against the Sikh army. The next destination for the regiment is Jullunder where Markham asks for a second six-month leave of absence for shooting. Markham and his fellow hunters travel towards Bengallee, shooting gooral and tahir, and then to Sookee, Jallah, Derallee, and Tienne Garde. Here they experience a dangerous encounter with a bear that they are trying to kill. A lengthy account is given of the snow-bear. In chapter 7 (pp. 148-170) they pass the Neila valley, called “the vale of flowers”, near the Buspa river. Here they kill burrell and snow-bear. Then they move on to the Asrung valley where they shoot ibex. A longer description of the ibex is presented and a sketch of the male and female ibex can be seen on a sheet after p. 158. The travelers move on towards Tibet through the village of Tangee where they are stopped from proceeding by the Tartars. The Chinese authorities that govern the province are very strict when it comes to admission of strangers into the country. Markham gives an account of the Tartars – their clothes, facial traits, hairstyles, and social organization. They are said to be good-humored. In chapter 8 (pp. 171-193) the travelling group passes by a religious Grand feast thanking for the harvest, held on the 14th of August in Jalah. They proceed to Benara through Palang, shoot some gerow and serow and continue to Phaidee, Missoorie and Loodianah. In chapter 9 (pp. 194-229) Markham is back on duty in Jullunder in March 1850, but after a meeting with commander-in-chief Sir Charles Napier at Kote Kangra, he is granted yet another leave of absence for hunting. Markham continues his sporting adventures in Umballa, Phaidee, and in the valley of Jumna, where he kills black bears, tahir and gooral. He later continues on to Musuri, and Jacka, crossing the Rupin pass and the Buspa valley. Markham and his companions move on to Sangla, Ragchum, the Pongee valley, the Manerung pass into Spitee, the Tartar village of Manes and Lahoul. The sportsmen then continue on passing a large river called the Chenab, to Koksur, Nelonti, crossing the Rotunka pass, arriving at Kooloo, after which they travel to Sultanpoor, Neolonti, the Kangra valley and the Kote Kangra. In chapter 10 (pp. 230-250) Markham’s travelling mate Wilson writes about his hunting reminiscences of the Himalayas from the previous year. He tells us about a hunter’s life and the adventures such a life entails. In chapter 11 (pp. 251-267) Markham tells us of his own risky adventures with bears. In chapter 12 (pp. 268-288) Markham mentions having read Lloyd’s “Field Sports in Norway and Sweden” comparing the bear of northern Europe to the snow-bear in the Himalayas. In chapter 13 (pp. 289-311) Markham and his companions travel from Mussoorie to Borasso, Koonawur, Peene, Ladac, and to Cashmere where they hunt wild boar. In chapter 14 (pp. 312-338) they reach Rampore on the Sutlej by way of Jugote and they continue on to Duroo, Bhaboo, the Teree Pass, Leloo and Kewar. In chapter 15 (pp. 339-375) the group reaches Ladak, where the Rajah of Ladak comes to see them before they continue on to Cashmere by the Bultul pass. They continue on to Koolon and to the Shalimar garden, which apparently was the “favourite summer retreat of Mogul emperors”. They visit the royal court of Cashmere and the Maharajah who is very interested in them. Markham describes his palace as dirty and without any of the eastern magnificence that they had expected. According to this author, Cashmere (or Seerinugger) is a filthy poverty-stricken place ruled by a series of bad and oppressive governments. The British had transferred the country to Gholab Sing in 1846. The people are described as a naturally fine and handsome race, but also as half-starved and wretched. Nevertheless, Markham thinks that the city can be regarded as picturesque with its mosques and bridges. Later on they continue their journey to Bidj Badra and Palgham Valley and then to the cave of Umurnath, a sacred spot for Hindoos. Islamabad, the Chumba district, and Kote Kangra are the last places to be visited on this journey. Markham returns to his regiment in Jullunder and together they march to Peshawur in January 1852. With no prospect of employment there, Markham returns home after having been away for six years.